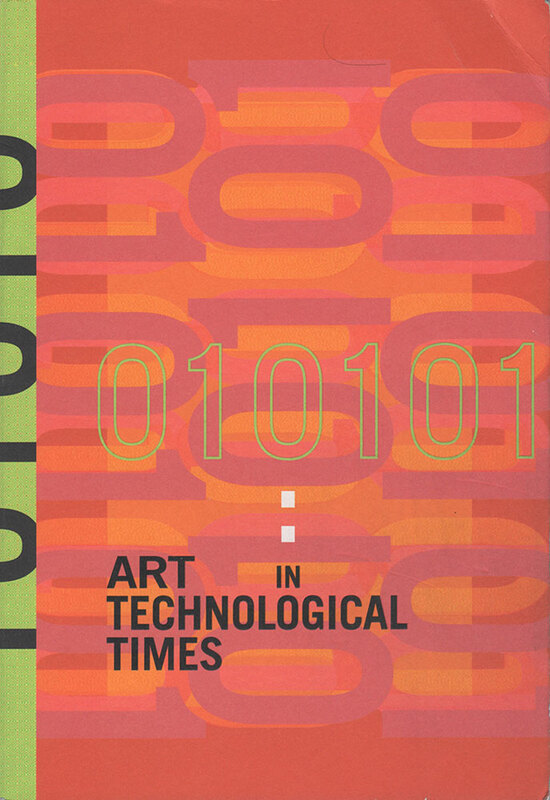 SFMOMA 010101 (2001). Step into the Frame. It is 1896, and members of a shocked movie audience, unaccustomed to the illusion of real space on film, are running out of the theater, fleeing a train they believe to be rushing toward them from the screen. In 1960 sensorama uses film loops, scent, and a vibrating seat to re-create a motorcycle ride through New York City—pizza, potholes, and all. And in the year 2001 a museum visitor floats through virtual environments created by artist Char Davies using a stereoscopic head-mounted display, interactive 3D sound, and an interface based on breath and balance (pp. 62-65). Artists have attempted to create the illusion of distance and depth on a flat surface since the early fifteenth century. Realities other than the tangible world we live in (the present) have existed since the beginning of time. In essence, what defines human consciousness is the ability to imagine other "realities," starting with the cognitive awareness of past and future. It can be argued then that, conceptually, virtual reality—and by this I mean technology that purely simulates tangible space—is not news. Useful? Yes. Seductive? Of course. But, in and of itself, virtual reality is simply a technological incarnation of a timeless idea. Having said that, the aforementioned virtual environments by Davies are indicative of a pushing forward of the concept of virtual reality as an artistic medium. By using the illusion of 3D space in a manner that does not merely mimic the world in which we live, Davies creates imaginary landscapes unlike anything that our senses are used to perceiving. It is precisely the unreal quality of these solitary spaces that allows the work to be psychologically transformative on some level for the viewer (or, in Davies's words, the "immersant"). Davies's efforts to induce a heightened conceptual awareness of our "ways of seeing" are reflective of another, related current in contemporary art—one that I will hereafter refer to as immersive art—which attempts to go beyond the bells and whistles of new technology. By definition, immersion is sensory interaction and therefore, like the proverbial tree falling in a forest, cannot be apprehended without a viewer. It is in fact our psychological and, at times, physical response to a space without concrete boundaries that reflects the blurry lot of contemporary society. Spaces of immersion function as a new artistic language that posits the viewer's experience as an art object by addressing the processes of perception. By recognizing the collapse of psychological and physical space, this work investigates the only reality that we can define—a fluid mix of mental space and physical interface. One artist whose work exemplifies this trend is Gary Hill, a multimedia artist who frequently explores the cognitive process in his artwork. Upon entering his installation Storyteller's Room (1998), the viewer walks into a black void, a room so dark that it is impossible to determine the form and dimensions of the space, or even discern the presence of other visitors. At irregular intervals a strobe light flashes for an instant. The brief bursts of illumination allow one to catch only fleeting glimpses of the physical surroundings. Was it a column or another visitor? A lit wall or a projected image? A shadow? It is hard to be sure whether we are remembering correctly what we thought we experienced a moment ago. Once one's eyes have adjusted to the darkness, the flashes of light can be identified as projected images that quickly fade to black. Representations of city streets, passing cars, and old buildings fit so surely within the architecture of the space that the walls seem to dissolve into transient windows on an outside world. Yet what we see and what we recall quickly collapse into a memory in the dark—a memory that we can never be certain is not colored by our own mind's eye. In a sense, this is the conceptual art of the new millennium—art that affects our perception and challenges our standard modes of processing information. Its core is firmly rooted in making us aware of the hazy juncture of a physical world and a space that is more psychological or imagined. Tatsuo Miyajima's work also often functions in a manner that invites us to question our sensory experiences. In Miyajima's Floating Time (2000; pp. 6, 104-5), as in Hill's installation, the viewer is plunged into a darkened space. The only thing the eye can make out is digits projected randomly through space. We have a sense that the blackness goes on forever, that we are immersed in a sea of numbers. It is a slippery sense of destabilization that gently urges us to come to terms with our own physiological reactions to intangible spaces of electronic data. In this way, Miyajima invites the viewer to engage the blurry residue of recent technological developments. These artworks are symptomatic of one of the defining features of the contemporary cultural landscape: the constant intersection of the material and immaterial, as manifested in virtual gaming, online communities, Imax films, simulators, DVD projections, and surround-sound installations. Turn the projection off, disconnect the cable, unplug the game, and what remains? An empty room, a blank screen, a memory of how it felt to be within that three-dimensional place where a wider existence was inferred. Yet we still have our subjective experience, a psychological reality that is arguably just as valid as any other. The technology used in immersive environments merely sets the stage for digital mediation in tangible space. It is then up to us to engage that space physically and psychologically. This is our reality. In a slightly different way, Melatonin Room (2001; pp. 66-67), an installation by the Swiss architects Décosterd & Rahm, also explores the relationship among the tools of technology, the body, and the mind. In this piece, the artists actually affect metabolism by way of lights that provoke sensations of lethargy or energy. With this environment, immersive art has been taken to its interactive extreme. The artwork is not a physical object in this case, but purely a dialogue between technology and the body. In our everyday lives, it has become second nature for us to accept this intersection. Ultimately Décosterd & Rahm have produced a space that, when engaged by the physical and mental body, reflects recent technology's influence on the permeability of the conscious mind. A constant stream of intangible thoughts and images, initiated by interfaces of technology, flows through our minds all day, every day, for a lifetime. The art of immersion explores just that interface. Contemporary living has become a hyperreal experience in which one can never be sure what defines reality and whether or not this even matters. Recent technological developments have forced us to confront these definitions. Quite simply, immersive spaces are an expressive medium that observes day-to-day life in a way that is somehow meaningful or even beautiful. The purpose, however, is the same as it has been throughout the history of art—to recognize and, at the same time, transcend the social context in which we live. Ultimately this art of immersion, of the senses, is simply an aesthetic reflection of the sometimes conscious, sometimes deliberate, but always willful way in which we create our own realities every day.